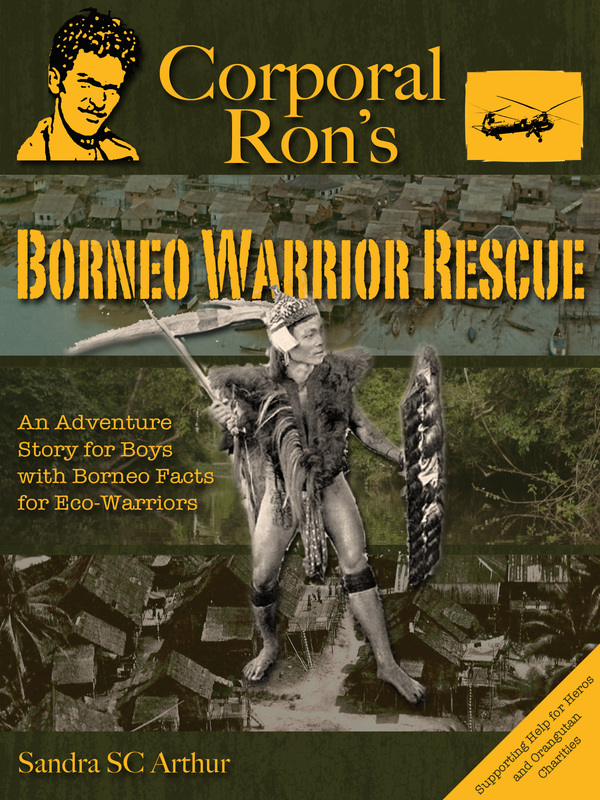 Corporal Ron’s Borneo Warrior Rescue is an adventure story that should appeal to boys aged 9 plus, as well as eco-wariors. It is a unique, fast-paced story about a fascinating country and a long forgotten “secret” war. Featuring Ron, a Royal Air Force (RAF) radio operator working amongst the Dayaks of Borneo, the story follows the perilous mission that Ron and two young warriors undertake through the rainforest. Along the way they must each face challenges while learning about the others cultures and the ways of the jungle. Borneo Warrior Rescue is also a great introduction to one of our rare rainforests: Borneo and its people, flora and fauna. This well-researched war-time story has drama, wit and fun. Information panels, at the end of each section, highlight the plight of the plants and endangered species such as orang utans. The story is a work of fiction, but was written as a tribute to the author's father, who was in the RAF in Borneo. The stories he shared inspired many of the events covered. Readers of all ages will find this a vivid, informative and enjoyable book. Unique historically themed adventure story. Environmental facts and stats for plants and animals of Borneo. This book is aimed at children (9 years +) and educators. Available as low cost eBook or printer paperback. Link to LULU site below to read first chapter FREE. This book has been written as a tribute to the author's father, Ronald A K Chidgey, who served in he RAF for 25 years. We have chosen to support Help for Heroes as they are a charity that we have great respect for, please consider donating to them as well. I’m now busy working to develop this for the iPad, that will include music, video and more photographs that I hope will appeal to even the most reluctant reader. As a kid’s book writer and mother of twin boys, I have been especially interested to figure out how to get boys to read books. Statistically boys in general are reluctant readers. It’s not difficult to understand why this might be. Boys like to be active, play with their friends and to have fun and fool around. Sitting static and staring at paper does not easily appeal. I read about a very progressive school in the USA, which has taken note, and allows boys to lie around on bean bags, rather than sitting upright at a desk to do their school work! Allowing boys to move, have fun whilst at the same time learning. The key here is to make learning fun. With that in mind I have set out to write a book that will appeal to mainly boys. I want them to have fun and enjoy my book, in the hope that this will lead them to explore other titles. Clearly there are already some very good books, but teachers and parents are always complaining there is insufficient material. I also had another mission, and that was to write a book as a tribute to my father, who definitely helped me to become a huge book lover. Ahead of writing, I conducted some unscientific research and asked a few boys what they like to read and why. I also visited my local library to see what books my kids would select, with no guidance. Plus, to also have a sneak look at what other boys were picking off the shelves! The clichés are spot on. It’s official: boys love stories that involve pirates, dinosaurs, cars, sport, war, fighting, space, facts, figures, spy/thriller style books. The feedback I received was that they love stories that include action – the more the better, and prefer and relate less to emotion or love novels. For many, they like to imagine that they are the hero in the story – so explorers on cool missions (huskie dogs racing to the south pole), detective style stories (such as Tin Tin), adventures in outer space are all winners. Another attribute that boys tend to love from books, are those that make them laugh. Books with jokes, funny pictures, or crazy situations are hugely popular. Hence all the cartoon style books, inventors, Dr Seuss titles and so forth are hugely popular as well. Boys tend to like stories that conjur up an image of what they might like to be when they grow up. (Archaeologist finding treasure, Sailing around the world, finding new species in the jungle, Solider, etc) Or they enjoy a story that perhaps matches their dream (to fly to Mars, making gold, travelling back in time, etc.). In short, a darn good adventure, with a great hero and if possible a few interesting facts thrown in. So with all those points, I have set out to produce what I hope will be a great book for boys (and eco-warriors!). The book is loosely based on some of my father's experiences whilst working in Borneo. He was an excellent raconteur, who could always spin an amusing story and make everyone laugh. I hope that I've been able to capture some of those elements into Cpl Ron's Borneo Warrior Rescue and ultimately my goal is to help boys love to read. Corporal Ron's Borneo Warrior Rescue is rapidly becoming a hit with fans all over the world. I absolutely loved your book and will definitely be promoting it to our Educational website. What a wonderful gesture on your part to donate your time to educate children on the plight of the orangutan. They need everyone’s help. Vicki C. Australian Orangutan Project, Perth, Australia. Action-packed and full of life, this military adventure story will appeal most to boys of all ages. I loved it, and I’m sure anyone who likes a well-spun historically based story will also. Ed A. France. It's amazing what you can learn about Borneo from picking up one of your books! Lisa, Birmingham, UK. The blending of facts, photos and catchy tales is really good. As an educational tool, with everything supplied to the teacher, it is a very good bet. Dr Diane A, Kingston, Canada. Sandra has done a fantastic job with her kids book to help build the awareness about the sad reality for many of Borneo's animals, I'd encourage you all to get behind Sandra and the animals of Borneo before its too late! I applaud your efforts. I think it’s absolutely wonderful that you’re reaching out to children to teach them about conservation for the sake of wildlife and the world. Avril O., Kanata, Canada. This is a very good story- I enjoyed it and will forward it to our year 2 teacher who will be doing a rainforest topic later in the year. Sandra SC Arthur's book will be just right for the fact and adventure reading 9 - 12 year age group. They devour facts about their world and really care about animals and their welfare and the ecological challenges. Eco-Warriors is a very descriptive word for their interests and activities. Sandra Arthur's book shows her devotion to Orangutans, World Extinctions of Species, Borneo itself and her family. Her philanthropic goals are outstanding and the readers will be anxious to contribute in any way possible and to spread the word on the fate of the animals. Adults need to know these facts as much as the children. I had no idea at all when Sandra Arthur began her writings a few years ago, and in general North Americans get little information about what is happening in Borneo. I was cleaning out my filing system when I found this interview form. Called The Next Big Thing. I believe this form is distributed to authors writing new novels to allow them to share more details about their work. I forgot to share my responses, but as they say, it’s never too late. Interview about the Next Big Thing – just for fun. Other titles did exist along the way but I will stick with this one! The inspiration to write this book was (a) to serve as a tribute to my late father, Ronald AK Chidgey who served in the RAF for 25 years and who did indeed work in Borneo and (b) to weave in environmental information about the unique country of Borneo in order to highlight the plight of the orangutan. Beyond making a tribute to my late father I wanted to address the lack of good material for boys to read. I also wanted to raise funds for charity and, as mentioned above, I wanted to highlight the plight of the animals living in Borneo. Taking on board the notion that many boys are typically reluctant readers, the story features soldiers, warriors, and follows an exciting, fast paced jungle adventure. It includes facts and statistic about flora and fauna. It also includes a variety of vintage photographs of helicopters, animals and warriors thereby I hope checking off all the correct boxes to appeal to boys. Early readings of the draft book offered positive feedback from adults as well (assuming they had an interest in Borneo and environmental topics). Wow, that would be something special. I think a young Pierce Brosnan would have been perfect for the role of Corporal Ron, but sadly he is too old for that part today. So someone like Aaron Taylor-Johnson could be an ace actor to choose for the part. Any offers or interest to produce?! It is a unique, fast-paced story about a fascinating country and a long forgotten “secret” war. I conducted a lot of research to get all the background facts correct. Sadly my father had died just before I commenced this project, so I was unable to ask him for a reminder of all his adventures. I therefore tried to find people who may have know my Dad or conducted a similar role in the RAF to secure more information. Also I was anxious to ensure that the information about the unique rainforest, the secret war and the life of the Borneo Dayaks was as factually correct as possible. I originally wrote the manuscript in a couple of weeks. It sat around for a couple of years and then I dusted it off and added and edited it for another two or three months. The detail, the cultural and historical referencing share a common theme to my book. As I mentioned above my father's experiences whilst working in Borneo provided the initial inspiration for me to write this story. He was an excellent raconteur, who could always spin an amusing story and make everyone laugh. I hope that I've been able to capture some of those elements into Cpl Ron's Borneo Warrior Rescue and ultimately my goal is to help boys love to read. Sadly my father died before I wrote the book – I think he would be chuffed to learn that he was the inspiration for this novel. At the end of each chapter I have included some facts and stats about Borneo wildlife. There is also a primate fact file at the end of the book. A group of parents/librarians in Seattle, USA, who have read it have approved its content and quality of writing. They now list it as a good book for boys to read on their website. “Sandra Arthur’s book, Cpl Ron’s Borneo Warrior Rescue will be just right for the fact and adventure reading 9 - 12 year age group. They devour facts about their world and really care about animals and their welfare and the ecological challenges. Eco-Warriors is a very descriptive word for their interests and activities. Sandra Arthur's book shows her devotion to Orangutans, World Extinctions of Species, Borneo itself and her family. Her philanthropic goals are outstanding and the readers will be anxious to contribute in any way possible and to spread the word on the fate of the animals. Adults need to know these facts as much as the children. I had no idea at all when Sandra Arthur began her writings a few years ago, and in general North Americans get little information about what is happening in Borneo.” Catherine M, Canada.